Hey, been awhile. Just thought I’d share this gem from the desk of Milana Samarskaya. She’s the genius illustrator for all things Sophichkin, and recently launched her online portfolio at misamarskaya.com — check it out! Sophichkin Gets a Lift on Amazon! Continue reading"Sophichkin Gets a Lift on Amazon!" Continue reading"Sophichkin Gets a Lift"
It’s been awhile since the last update, so I thought I’d take this opportunity to clue you all into what’s what in the world of Sophichkin, and, as an added bonus, toss a “new” story out to the universe to see what happens. The “new” story, entitled I Am, is a bit of a departure around these parts, as it isn’t a Sophichkin story at all (although I think her fans will like it just the same)! It is intended to be the origin story of another little universe I’m creating for exciting, fun and sometimes scary stuff to happen in. Of course, it’s just a work in progress, but I’ll be adding more and more like this in the coming months (I have two more just sitting around collecting dust already). I’d love to hear what you think! I guess that’s all for now. I’m sick, so I’ll be getting back to bed now. Sophichkin Sings to Monsters on Amazon! Continue reading"Sophichkin Sings to Monsters on Amazon!" Continue reading"Sophichkin Sings to Monsters"
Even when things are quiet, the Sophichkin train keeps on a’rollin’. 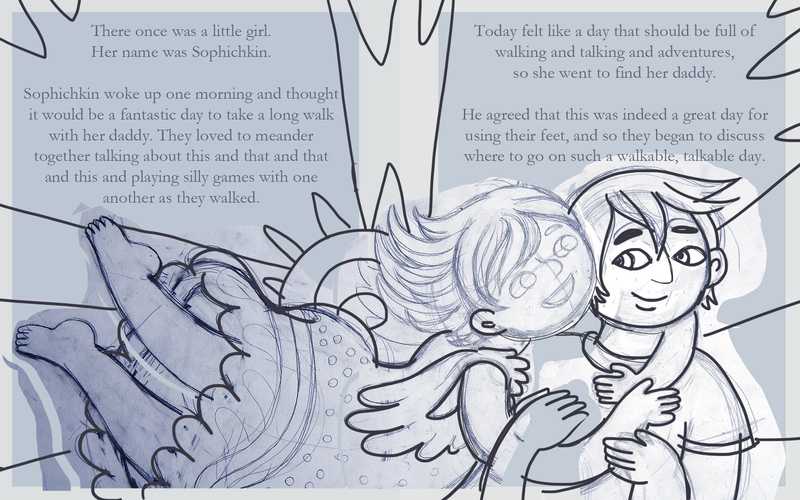 All the illustrations are in for Sophichkin Sings to Monsters and Milana and I are finalizing the cover now! Once it’s ready, I plan to make it available for free as an eBook on Smashwords and at cost on Scribd and Amazon both, so stay tuned. Up next is Sophichkin’s Teacup! On that note, I’ll be porting all of the yet-to-be-illustrated stories to myriad digital formats and making them available for free on multiple channels (including Scribd and Smashwords). I was recently challenged by a friend to produce one story per month for the next year and to give them all away. So it’s on. I counted Sophichkin Gets a Lift as the first story in the challenge, so only 11 more to go! I’ve started work on a few new projects, among them one short story collection (#bears, #tourists, #monks, #eagles) and a short novel length story (#soulmates, #goats), both for young adults. The real life Sophichkin also fed me the synopsis for another children’s book this very morning, informing me that I have no say in the matter — it will get written! Fairies and insects are involved. So there’s that. Assuming she has the time and willingness to work with me again, this one should be a bonanza of fun for Milana to illustrate.